One of these traditions sits in the rural area of Cedar Falls. It is called Antique Acres. 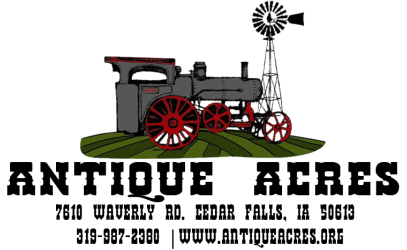 Founded in 1964, Antique Acres is best known for its yearly Old Time Power Show in August, which is dedicated to the preservation and operation of antique machinery. Here you will find exhibitors displaying collections of farming equipment of all kinds, jelly being made on an old fashioned wood stove, or horses pulling an antique plow. A “Parade of Power” from antique garden tractors to powerful steam engines, which put on a beautiful light show after dark, is only one of the 3-day show events. A museum at the Acres houses many old time and valuable pieces which can also be viewed during one of the many tours conducted for out-of-town groups, schools or just someone stopping by. A campground with shelter and stage are also available as well as an air-conditioned hall with kitchen facilities to meet your needs. Looking for a place to hold your next event? Visit our facilities page for more information. Our Antique Acres history scrapbook is missing. We are offering a $50 reward for the return of the scrapbook with no questions asked. We would just like to have it back. Please call our number or drop it off in front of the office.